Nearly 60 members, students and guests attended the 2017 Society of American Indian Dentists Annual Conference Wednesday, June 21 - Saturday, June 24 in Cincinnati, Ohio at The Westin Cincinnati. This year, we had a record number of students in attendance. Airfare, hotel and conference registration for students were paid by the generous support of our sponsors and members. We kicked the conference off with a tour of the Procter & Gamble facility in Mason, OH thanks to our friend, P&G's Dr. Bryan Osterday. Then, over the next two days we enjoyed 13.5 hours of continuing dental education with presentations on topics including forensic dentistry, dental anthropology, Silver Diamine Fluoride, Ideal Restorations, Periodontal Disease and many more. Moreover, City Councilor, P.G. 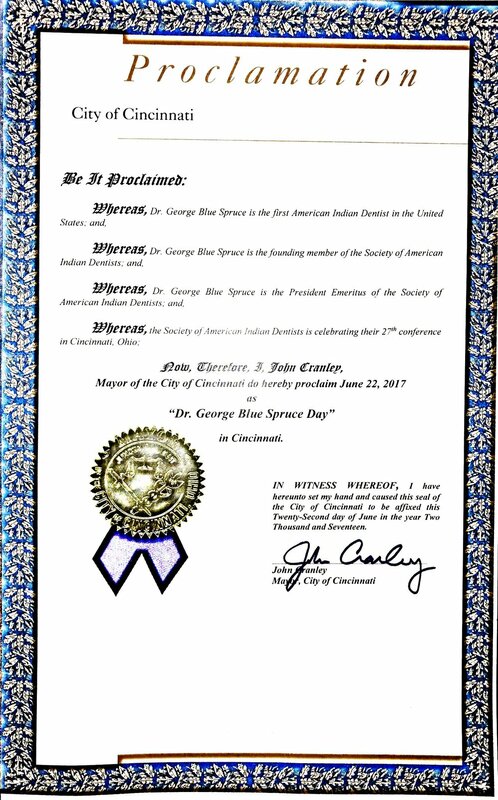 Sittenfeld, presented two proclamations declaring June 22, 2017 as "Society of American Indian Dentist Day" and "Dr. George Blue Spruce Day" in the City of Cincinnati, OH. Dr. Matt Williams and Dr. Lauren Smith completed their educational program with our traditional blanketing ceremony. Dr. Drew Preston, Dr. Susan Sergie were each awarded $10,000 the SAID/Colgate Post Graduate Scholarship. Jacob Collins and Brianna Chavis-Locklear were awarded the SAID/Procter&Gamble Student or Resident Scholarship. Finally, on Saturday, we traveled to Fort Ancient Earthworks Preserve located at Oregonia, OH. The state park and museum is centered around American Indian mounds built some 2000 years ago.